Pancit Molo or Molo Soup. Whatever you call it, I call it delicious. Ever since I was a kid, I've always loved Pancit Molo. It was usually served during special occasions so I've associated this dish with, for lack of a better word, joy. Think soul food, comfort food, and home cooking. For me, no special occasion is ever complete without it. And every ordinary day becomes special because of it. I've written about Pancit Molo a while back. But it was only today that I found out Mich shared a recipe of hers of this dish in the comment box of that particular post. I'm bringing that recipe up here for all of you to try. 1. boil the broth cubes and the chicken together. 2. While waiting for the chicken to cook (just enough for you to remove it from its bones), mix all ingredients for the molo filling. 3. 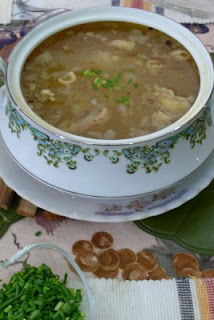 Remove cooked chicken from the broth and cut into small pieces or flakes (remove the bones). 4. Add the chicken to your filling mixture and mix well. 8. add some of your browned garlic as well as the spring onions to the soup. Reserve some for individual serving. 10. Eat as you please!